Today saw a total solar eclipse visible across a thin sliver of earth, starting in India, cutting across China, then clipping a few southern islands of Japan. The tiny World-Heritage jungle island Yakushima, 50 miles off the southern coast of the Japanese Mainland, lies just within the northern end of totality, while the larger Amami Oshima 150 miles further south (half way to Okinawa) lies across the southern edge of totality. In between there are a dozen or so scattered postage-stamp islands, only a few of which have some human presence. More than a year ago, Fumie was able to secure a hotel reservation on Yakushima by winning a lottery for one of the last rooms available on the island. This was more than a year ago, mind you. We were excited, me mostly because of the eclipse, but both of us because Yakushima has long been on our want-to-visit list. Its dense-forest ecology is believed to be unchanged since ancient times, and it's apparently quite beautiful. Some time during last winter, I went to actually get our plane tickets there, and found out that I couldn't: Japanese domestic tickets go on sale at 9am two months prior to the day of the flight, so on that day (May 22) at 9am, those who had been planning for years would vie with those who thought about it the previous day on a whim, for the few tickets available. So, if you want one of the tickets: at 9am on the day, you try to get through on the phone or the website, and if you're luckily enough to do so, you will find that between the time you're told there are seats available and when you actually get finished entering your contact and payment info, they will be gone. This has happened to us in the past, just looking for normal flights to a normal destination on a normal day; gone by 9:03am. People in the know have a travel agency use their special computer to get the tickets at 9am, knowing that by 9:01 they'll be gone. By the time I checked (with much help from my friend Shimada-san) last winter, every travel agency had a waiting list to try to get tickets, with the somber realization that they'd be lucky to get a ticket for just the first person on the list. It was a total waste of time unless you counted on being very, very lucky, in which case you'd do better to play the lottery. It's even worse than that, though. Yes, there are a huge number of people vying for only a few seats, but even those few seats might not be available, as government agencies and pseudo-government agencies like NHK (national TV channel) will likely appropriate many of the seats.... at least those that the airline doesn't hold back for itself. There well may have been zero seats available. Okay, so what about by boat? Here's the kicker: boat/ferry tickets don't go on sale until 9am, one month prior to departure. I should interject that there's no law or requirement that it be this completely moronic; it's just Japanese convention. The Way It Is. The very knowledgeable travel agent I spoke at length with said that the huge overflow of those unable to get flights would all line up again in a month to try to get ferry tickets, and that she'd be happy to try to get one on my behalf (she'd have to call the ferry company just like I would), but that chances were exceedingly slim. I asked the travel agent “Isn't this really inconvenient for everyone involved?” and she readily agreed, showing empathy to my predicament, but it was in some way as if I had asked “Isn't it inconvenient that the tide keeps moving the shoreline back and forth?”. She didn't like the situation, of course, but had no angst about it (at least not anymore, or that that she showed) because It's The Way It Is and she can't do a single thing about it. There's no use getting angry because you can't hold back the tide or move a mountain. It Is What It Is. The situation may be old hat to her, but it's fresh to me.... just ridiculous... infuriating... disgusting. Maybe I should have played the lottery. Maybe I should have actually tried to get a flight or ferry. Maybe I should have coughed up the $4,000 to an exclusive private boat tour that would stop at the aforementioned uninhabited postage-stamp islands for eclipse viewing. But I didn't. This slice of Japanese culture so defeated me... so disgusted me... that I lost my will to even bother. The aqua label on the screen says “Broadcast Live from Iwo-Jima”. In eastern Kyoto, I was 782 miles away. My area of Kyoto got about 80.8% totality, which perhaps sounds like a lot, but you could have been outside all day and you wouldn't have noticed it unless you knew to look for it. It did get a bit darker, but with the overcast, it was decidedly of the “looks like a storm's coming” type. 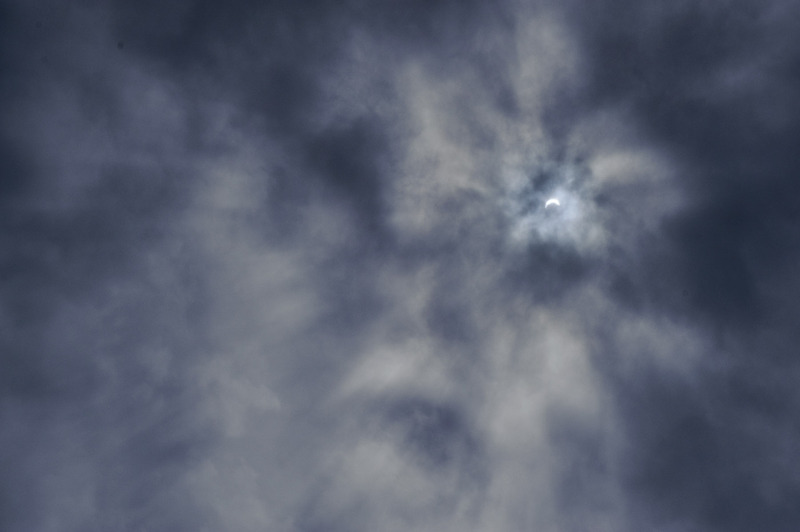 Some parts of the sky were less gloomy than others, and for a bit, I could look straight up and see the shape of the sun through the clouds. The clouds made for great eye protection, so I could just look directly. These pictures make the clouds look really freaky, but they weren't. They were just normal, bland overcast. And I'm joking about “great eye protection” – it was probably pretty stupid to look as we did, risking a sudden parting of the clouds. Watching news reports later in the day, it seems that Yakushima was totally rained out. 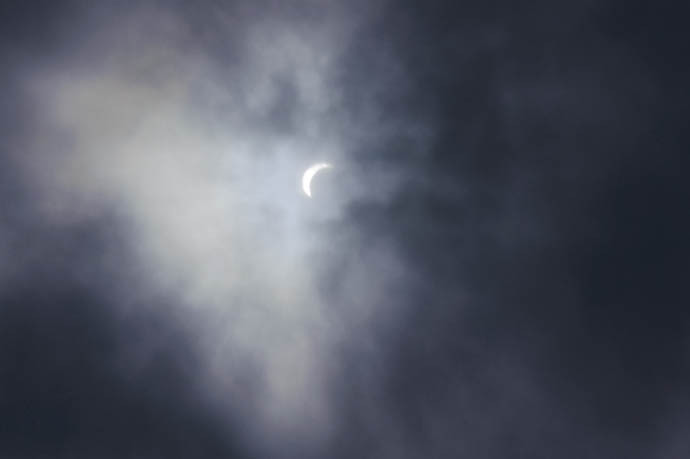 A friend in Amami told me that it was completely clouded over during totality. One report from an island whose name I didn't catch showed fast-moving wispy clouds, but mostly you could see things, and the reporter was awestruck. Just offshore was a cruise ship with many hundreds of people that had apparently intended to dock to allow the passengers to experience the eclipse from land (something I'd certainly want to do in preference to a boat, but it'd be especially important to anyone hoping to take pictures), but it couldn't due to the choppy seas, so just sat out there, pitching in the waves. So all in all it was a pretty big bust. I guess I'm glad that I didn't waste thousands of dollars going to Yakushima or Amami, but frankly, I don't feel the better for it. I was well aware of the likelihood of cloud cover and was more than willing to take my chances, and I would much prefer a washout than the total disgust I have with this travel slice of Japanese culture. 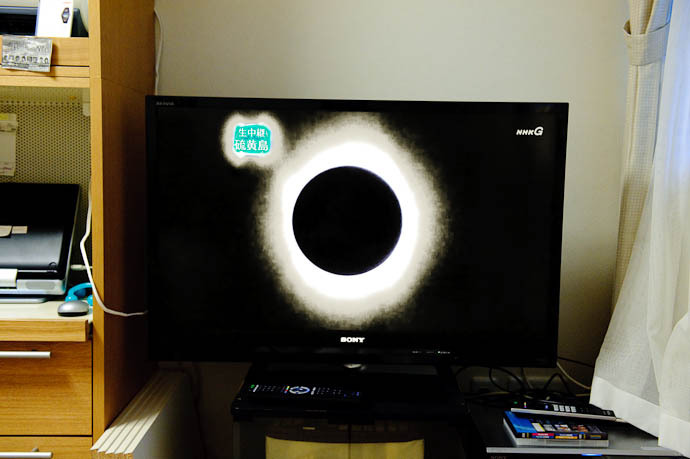 At my house in Kyoto the eclipse will be fully annular, but the ring around the sun will still leave about 6% of the disk visible (put another way, 94% totality), which is still really really bright, and as such you can't look directly without ample eye protection (such as an overcast day like today!). An annular eclipse is phenomenally less interesting than a total solar eclipse, but you take what you can get: when it comes to nature, there's no sense getting upset, because That's The Way It Is. Perhaps they feel it’s more fair this way. Everyone has to vie for a spot at once. It would be “unfair” for you to have a seat on the plane just because you chose to plan a year ahead. What about those who didn’t know about the eclipse until just now? Of course, that’s all sarcasm, but I wonder if that’s where it comes from. I hope you try to go to Yakushima some other time. I’ve been there and it’s quite lovely (or was when I visited 18 years ago). Open air hot springs right next to the sea as I remember, great hiking, and very few vending machines as compared to other national parks. We took the ferry, BTW (convenient as I was living in Kumamoto) but beware if you park your car on the docks in Kagoshima-shi as you are likely to find it coated in ash from Sakura-jima when you return. I feel for you brother… But don’t worry, there are a lot of eclipses around the world, even total ones. It could be a reason to organize a trip abroad around it. I’ve been thru one already in my life and that was amazing. I was young so I want to see another one. It’s frustrating how close you were to it, but as you said, that’s the way it is. The fact the crappy travel situation is not an act of nature but rather an act of man, doesn’t detract from the fact that it can’t easily be changed. You just can’t change a whole system like that overnight. So don’t feel angry about it because it’s kind of the same as the tide. Yakushimi is indeed an amazing place, full of trees that are thousands of years old, lush moss, and great hotsprings. Eclipses, however, are when one celestial object passes in front of another with relation to the Earth. I can see people might have gotten excited about these thousands of years ago, but all the fuss just leaves me confused. If the moon passing in front of the sun is a mystical or meaningful experience for someone, then they seriously need to find some more sources of meaning in their life. Well, lots of people use words like “mystical”, but you didn’t so we’ll leave that out. It would have to be meaningful, or else people wouldn’t spend so much time and money for the experience. Your words “interesting” and “beautiful” are just two kinds of meaning, although it is a stretch for me to imagine how anyone could describe as beauty the sight of a 2 or 3 mm white circle temporarily becoming a 2 or 3 mm black circle (assuming you are using those special glasses to look). Also, Google-foo lets me know that solar eclipses happen 2-5 times a year, so they aren’t all that rare. What’s rare is for them to occur where you are. But those things are all visually striking for one reason or another. You have yet to inform me why you think a 2 mm circle turning from white to black and then to white again is comparable to rainbows or thousand year old trees. It’s nice to see you can still get worked up about cultural differences even after living abroad for so many years, Jeffrey. Seriously: after a while you begin to feel so at home that it can be easy to forget that this is not your native culture. I suppose that’s why just occasionally something like this gets us so irritated. I’m sure you know that rants like yours are exceedingly common among people new to Japan, but even the best of us fall into ranting from time to time. However much it might bother us, perhaps the 仕方がない (it can’t be helped) attitude is indeed the best way to go. After all it surely is the way it is, and neither you nor your travel agent has the power to change it. Banging your head against the wall will not change things, but it will certainly leave you with a sore head. My own pet peeve is not unrelated to your rant (you even mentioned it in passing): I despise the Japanese attitude to holidays and taking time off. Come to think of it, time-keeping in general. A couple of weeks ago I was forced to use two hours of my holidays to go with my wife to submit my visa-renewal documents. This really bothers me, because if I was single it would almost certainly be someone from my workplace who had to accompany me, and in that situation I highly doubt they would have to use holidays to do so. But they ruled that it’s not work related, so there’s nothing I can do. Worse, I will have to go back to finish the renewal next week – and of course again in a few years’ time. The problem here is that what Westerners consider to be holidays is actually just “time off” to the Japanese. Other teachers at my school have to take time off just to go to the post office or the bank, or even the hospital if they are sick. So it’s hard for me to argue. At the root of this is the whole idea of holidays, which is for me one of the biggest cultural differences between Japan and Britain (where I’m from). The headmaster’s speech to the kids at my high school yesterday sums it up well. He told them he would like them to find some work to do (he actually said 仕事) and then spend the holidays doing it on the same schedule as the regular school day. Another example of this thinking is the tendency for people to travel for a specific “research” purpose – even if the purpose is spurious and in reality just a cover allowing them to do what they really want to do. 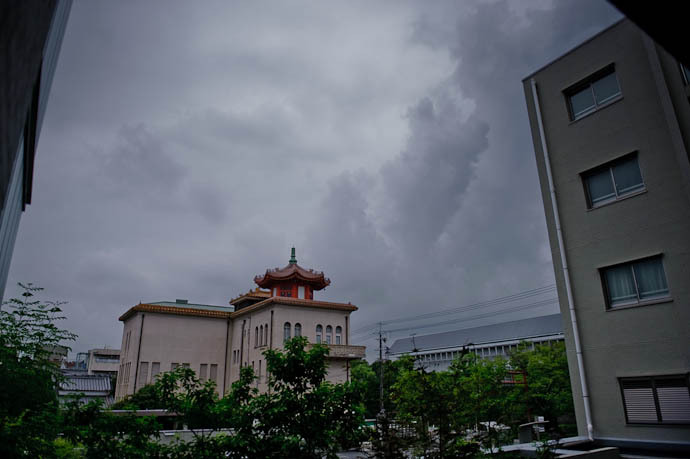 School trips are the most well-known example of this; even the name, 修学旅行 implies learning rather than fun, although in reality most trips include opportunities for both. I know of some university professors who plan trips abroad where they make cursory visits to academic institutions to allow them to take the trip under the name of “research” rather than “recreation”. I don’t think Japanese society in general approves of recreation, even though individually most Japanese people do. There’s a kind of stigma and shame linked to just having fun, which is tragic really because it separates the world artificially into “study” and “fun” when they do not always have to be separate things: studying can be fun, and leisure can provide real learning experiences. The other issue with holidays is that it’s frowned upon to take all your holidays at once, to the point where most Japanese salaried workers (including civil servants) don’t even try. A 10 day trip is viewed as a very long holiday, and most people don’t take more than a few consecutive days off at a time. I believe this is one of the primary reasons why young Japanese people don’t tend to travel abroad that much, and it also explains why they go for such short periods even when they do. As is so often the case with ranting, I’ve run on too long. So let me end by explaining how I usually deal with this sort of thing. Basically, I opt out of aspects of Japanese culture that I don’t like. It’s not always easy (or even possible), especially if you also want to take part in some sort of popular event such as the eclipse. But I find that if you are willing to think creatively and adjust your plans accordingly, it’s often possible to play your gaijin card and just opt out. In my case for paid holidays, clearly I haven’t been able to do this all the time. I take great care never to use my holidays, because they’re essential for my family to travel back to Scotland to see my family there, but it’s not always possible to avoid using them up. On the other hand, I put my foot down in regards to taking all my holidays at once: I simply will not take no for an answer. It probably helps that I never use up my paid holidays voluntarily at other times, but I think the fact that I’m a foreigner is likely the main reason I can get away with long holidays which my coworkers likely couldn’t get. (By the way Jeffrey, the ship docked in Kobe and I am now touring Japan for the first time. Reading your blog the last few months has been a really interesting introduction to this country for me). I’ve seen both, and I thought the annular eclipse was much more impressive than the total eclipse. pictures are wonderful and enjoyed the text. My son ,Philip lives in Kakoshima and sent pictures too. They too, are great. 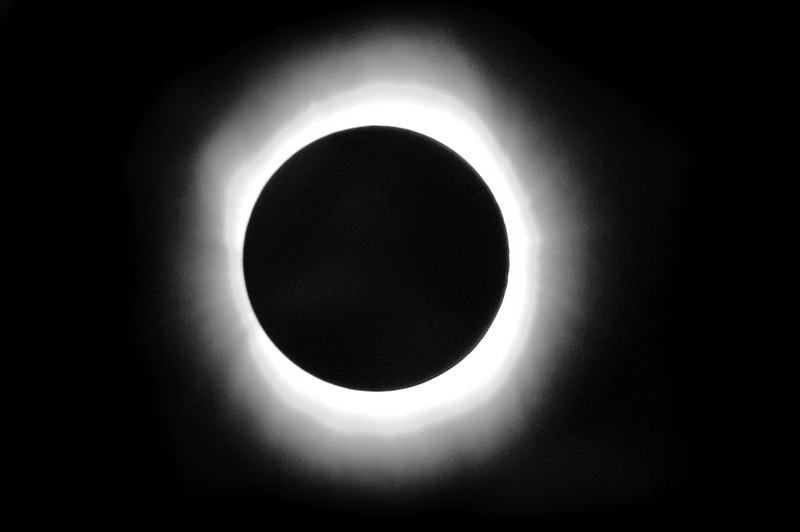 Just wondering if you are planning to photograph this weekend’s eclipse. I’m in Portland and will be traveling a few hours south to be in the zone of annularity. I’ll be shooting a D700 with a 300mm f/4, 2X teleconverter, and a Hoya R72 (IR) filter. (Or near red filter actually). My test shots indicate something like 1/8000, f/18, ISO 200, for the late afternoon (full) sun. It’s true that many shots will look alike, but they should still impress friends and family. I think with an annular eclipse, it is at the margins that the eclipse has the most promise, (rather than the ‘central’ annularity). If there are Bailey’s Beads for example, as the sun peeks around the mountains of the moon, that could be fascinating. Also the presence of clouds can add uniqueness, as you know already. Good luck.